Good episode of Build. I guess they were saving all the Banjou girlfriend stuff for this episode. Liked the bit of Sento narrating Banjou's thoughts. They need more of this. Just the buddy buddy interactions. It's a real hit and miss situation for me, since sometimes the interactions feel real artificial. Cross-Z's design looks good. He has some pretty good attacks. I wish they'd give Banjou more rapid punches. Like they always give Banjou one strong punch, and they apply the effect for that. And that's it. I guess it's cheaper to animate, but it's disappointing since you want to see a boxer punch stuff. Like maybe give him a finisher where he does an upper cut or something??? Also, I just noticed that Ryuuga's stupid name means "I am a dragon". Gotta love Stark popping in, harassing Rogue by throwing a thing, then peacing out. Why does Rogue put up with him again? Sento, aren't you supposed to be smart? Why are you asking why Stark saved you guys. You saw the video, Stark is made to raise the Hazard Levels in Riders! I bet Stark isn't even human, he's probably an automaton or an AI. Hence, why he has no regard for human life. I'm just curious who is currently in control of Faust. Rogue and Stark clearly are running things, but no one is the superior. Another great episode overall. Banjou is an interesting secondary Rider, in that we got to know him and his background early, before finally becoming a Rider. Good stuff regarding the GF story resolve. Sawa subplot seems to be resolved as well? Maybe? Unless her being turned to Smash and coming clean was a set up to win their trust again? Assuming they continue their trust. We're still early in the series, but Build is doing strongly at this point, by standards of the past 3 seasons. Well, I saw it and that the file no. 2 review of Blood Stalk, even showing it on screen, as well as that data card for that holographic version of him and its the same as in the Ganbarizing card and of the merchandise for underwear. Just ignore him, he's probably just trolling you. I think this is the first time in a long time we had a secondary rider that was introduced from Episode 1 (Not counting multi rider series). I think Kabuto was the last one to do that. I'm still putting money that the coffee shop manager is Stark... he's been suspiciously absent in the last few episodes that have been Stark heavy. Ok this is good, this is good moment for Banjou to start changing from avenger to hero. I really liked his selfishness, felt realistic. Why everyone must have this grand sense of justice, especially someone who got screwed up so much. 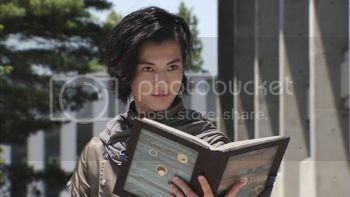 Those 2 might become my fave friend duo in Kamen rider, they interactions i so great. The best thing is that Sento rigged cross dragon to not activate until Banjou feels like saving someone, it also makes sense because power can corrupt you. His design is awesome, i love added elements to make him different from just dragon half on both sides, also Ryuki inspired kick, but still different cos he swipes it inwards, and Ryuki just kicks straight on. Also, at least for an episode or maybe more, we gonna have Sento stop being rider altogether, which is unique and awesome. So if the Transteam system is as powerful as the Rider system, why do they need to develop the latter? It seems to me that they already have their weapon (and it requires fewer bottles to boot). At this point Stark is just trolling the hell out of his "ally". It's fantastic. Bandai logic. This guy is a pro fighter and has been fighting unarmed. Lets give his Rider form a sword. I love Cross-Zs design. The base suits halves have the flame effects on the opposite upper and lower limbs and the dragon armour covers the base Build silhouette to give a distinct appearance without being drastically different. I was hoping they'd have to share the driver or Build would take a back seat, but Sento whips up a second one post haste. Following that link, I noticed in the background of the site, we see an army of Guardian bots actually looking like bots. Unlike in the show. Is that an artist expression? Or is that spoiler material as to how they will look later? Cause they look pretty cool. MGS robot style. So if the Transteam system is as powerful as the Rider system, why do they need to develop the latter? I made a suggestion to make it not sound so equal. I don't know if they used it or not, but mine was: "With the power of the bottle, it can achieve power comparable to the Rider System." I think the original intent was that it was almost, but not quite as powerful as the Rider system. Is the robot design different on the asahi website? The robot design is different. Full body armor. Look, I'm not pleased with the Cross-Z name, but I won't be going to every thread to complain about it. 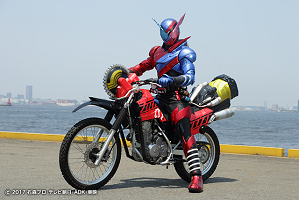 I'm glad that Eitoku is back portraying the secondary rider. Hopefully he's fully healed! Oh he's back? Good to hear.